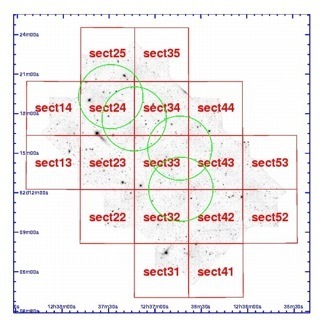 PEARS is the Probing Evolution And Reionization Spectroscopically HST program. PEARS was conducted in the GOODS North and GOODS South fields using the Advanced Camera for Surveys (ACS) in Cycle 14. Observations were made during the period 2005 August 8 to 2006 February 17. The PI of PEARS is Sangeeta Malhotra at Arizona State University. The proposal number is 10530 and 200 orbits were allocated for the program. Slitless spectra over both fields were obtained with the ACS Wide Field Camera (WFC) and the G800L grism over the 204x204 arcsec detector area. 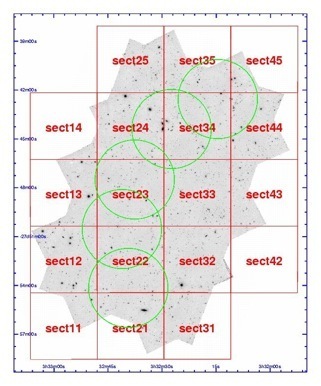 Short F606W images were also obtained to align to the GOODS astrometry and to provide the zero point of the slitless spectra. The G800L grism provides slitless spectra with a dispersion of about 40Å per pixel, but the achieved spectral resolution depends on the size of the dispersing object. For a point source, the measured resolution is about 100Å, varying with wavelength. The grism first order covers 5500-10500Å with peak sensitivity around 7500Å. In addition to the ACS slitless spectroscopy and imaging, coordinated NICMOS parallels were obtained in the PEARS program in the F110W and F160W filters. The NICMOS data are not included in this release. A readme file describing the data is available. We provide a search interface for the PEARS catalogs. A list of the columns with examples of valid data and ranges for numerical fields. Selected files may be downloaded as a tar file from the search results by marking the desired files and clicking the download data button. The data and catalogs are also available via anonymous ftp from archive.stsci.edu. GOODS-N Field showing the four PEARS Pointings (green circles) on the GOODS tiles. GOODS-S Field showing the five PEARS Pointings (green circles)on the GOODS tiles.